Why was the global economic order so stable for so long and why does it appear now to be under such threat? For years now, I have been researching this question, examining both individual-level trade policy preferences and Congressional voting on trade bills. Trade preferences are highly complicated—more complicated than even most researchers of the topic realize, as I argue in my forthcoming book, The Politics of Fair Trade: Moving Beyond Free Trade and Protectionism—but, at least until recently, they have been remarkably stable, with enough support amongst both policy makers and the general public to move forward towards ever increasing globalization. The reason for this rests on what Harvard political scientist John G. Ruggie calls the compromise of “Embedded Liberalism.” After World War II, throughout the entirety of the rich capitalist world, classically liberal economic policies like free trade and capital mobility were embedded within social policies designed to compensate those harmed domestically by these policies. In Europe, this often took the form of generous welfare states while in the United States it took the form of more targeted compensation programs, most notably Trade Adjustment Assistance (TAA) which provided unemployment insurance, job retraining, and other benefits to those harmed by trade. Ruggie argued that this compensation mitigated opposition to trade because there was less of a downside to workers who might lose their jobs due to increased imports. Further, these programs would insulate the global economic order from recessions as the “automatic stabilizer” compensation programs would naturally grow as more people needed the compensation. In the decades since Ruggie first described Embedded Liberalism, the system appears to have worked and the scholarship has shown that this compensation system is at least partially responsible for the continued support for free trade, at least in developed economies like the United States and the members of the European Union. Much of my own research has been dedicated to investigating the effectiveness of compensation using survey and experimental evidence. For instance, I have found that those who will receive more compensation if they lose their jobs are less likely to oppose trade; that those hurt by trade are most likely to support compensation programs; and that informing those who might be hurt by trade of the existence of compensation programs reduces their opposition to trade. Other research has suggested that this linkage may only work in the developed world but there is now fairly strong evidence that, at least in wealthier economies, compensation programs have increased support for trade for the last few decades. So why has this system possibly failed this year? Much of the blame goes to the 2008 Global Economic Crisis and the responses to it, although some of the root issues predate the crisis. Limited median wage growth and increasing economic inequality had created frustration with the global economic status quo even before the 2008 crisis. Even though free trade was not responsible for the crisis, increased unemployment and lower wages are consistently linked to less support for free trade. The length and depth of the crisis, as well as the tepid policy responses in both Europe and the US, exacerbated this. Also, although the economy in the US and parts of Europe have begun to recover, and overall support for trade has begun to increase again, there remains deep skepticism of trade amongst many individuals as, once again, GDP growth has not necessarily led to wage growth. In the US, the limited nature of trade-related compensation and the weak welfare state in general have intensified pressures felt by workers whose jobs are under threat. TAA provides expanded unemployment insurance (but not permanent compensation if one loses their job to trade) and job retraining. As the Crisis deepened, though, many people were unemployed so long that they ran out of insurance (and the government, which had been extending unemployment insurance in general for much of the crisis, refused to extend it further.) Job retraining programs also only work when there are many employers hiring. In a general economic downturn, this is less likely to be successful than when only a small number of industries are harmed by trade. The compensation mechanisms that undergird embedded liberalism in the US were, thus, insufficient to deal with the Crisis. In Europe, compensation is usually provided by the broader welfare state rather than through trade-specific programs. After 2008, many countries in Europe, such as the UK, pursued austerity programs which cut the size of the government, often with the explicit support of the population. Normally, countries respond to recession by expanding the government, both because there are more demands on welfare spending during recession and because government spending can stimulate the economy. The decision to pursue austerity was meant to reduce government debt and create long-term economic success. In the short term, though, it led to further contraction of the economies, worsened the global recession, and limited the amount of welfare those hurt by the Crisis could receive. It is not entirely certain that these concerns with trade led to the victories of Brexit and Trump and the seeming rise of populism throughout the rest of Europe. Trump, though, explicitly campaigned against free trade and has made it clear that he will withdraw from negotiations over the Trans Pacific Partnership (TPP.) Brexit, if it actually happens, would remove Britain from the EU. Thus, it is clear that the recent increase in economic nationalism and populism has put the global economic system under threat. One reason why Brexit and Trump took so many by surprise is that recently protectionism has been more associated with the left, yet much of Brexit’s support came from the right and Trump is a Republican. However, the core argument in my book is that trade preferences are not unidimensional, let alone arrayed along the left-right continuum. In the book, I focus on altruistic motivations for trade preferences, such as concerns about the effects of trade on workers and the environment in our trading partners, but another possible dimension is economic nationalism, which recently has been associated with the right and, in particular, with people who are poorer, less educated, and at least somewhat conservative. While this block of voters did not make up the majority of Trump’s supporters, they may very well have swung Pennsylvania, Wisconsin, and Michigan to Trump and, thus, swung the Presidency to him (as well as control of the Senate to Republicans). Protectionism is actually no more popular now than it was over the past few decades, but Trump seemed able to mobilize voters by linking protectionism to broader issues of economic nationalism and populism, in particular immigration, terrorism, and opposition to ‘global special interests’, seen in Trump’s final campaign ad. Though the system has been put under stress this year there’s no guarantee it will collapse. It is hard to predict what Donald Trump will do as President. TPP is almost certainly dead and it is highly unlikely any additional major trade agreements are signed under his presidency. It is also likely that the US will take more advantage of legal protectionist instruments like anti-dumping and countervailing duties. Recent talk about an across-the-board 5% tariff is worrisome, but it is highly unlikely the US withdraws from the WTO or NAFTA. A single term of President Trump might only result in reversible or at least limited increases in protectionism, although it is possible President Trump does more than this and if his election is a signal of changing attitudes towards globalization then any changes President Trump does make to the global system are likely to continue into the future. We know even less about how Brexit will affect the global economic order. While it is fairly likely at this point that Brexit will actually happen, even that is not assured nor do we know when it will happen. Further, a ‘soft’ Brexit where Britain remains part of the Single Market would have little to no effect on global trade or financial flows. However, a soft Brexit seems increasingly unlikely and the probability that Britain leaving the Single Market appears to be increasing. Even this outcome, though, may not mean much at the global level. Britain is an historically free trade country and, released from the Common External Tariff, might actually have lower tariff rates after Brexit than they did before. Though trade with Europe would decline in this scenario, it could be more than made up for with increased trade to the US, Canada, Latin America, and the Asia-Pacific areas, depending on the policies enacted in these other countries and regions. On the other hand, if Brexit is just the first step towards the dissolution of the European Union — the recent referendum in Italy, and electoral trends in many EU states, certainly suggests such a thing is possible – then this would be a devastating blow to the global liberal economic order. In conclusion, it is too soon to predict what effect Trump’s election and Brexit will have on the continued existence of embedded liberalism or the increase in globalization it has allowed. 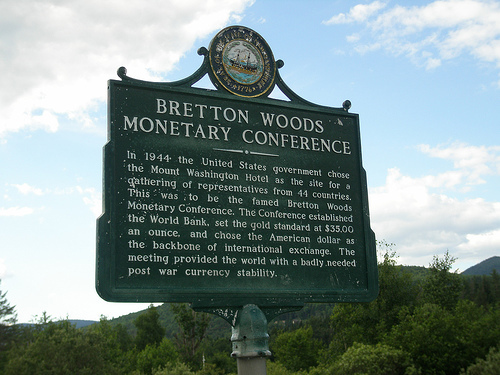 These twin events, though, have placed the post-War economic consensus under the largest threat it has ever encountered, possibly only rivaled by the oil crises, stagflation, and the American abandonment of the Bretton Woods Gold Standard in the 1970s. Embedded liberalism and the global economic system survived that period of crises, but, as the saying goes, past results do not guarantee future performance.